Be creative this holiday and have some fun making your own special treats for yourself or gift-giving. Bring the cream to a boil in a small saucepan over medium heat. Place the chocolate in a large bowl and pour the cream over the chocolate. Stir with a wooden spoon until smooth and all the chocolate is melted. Add the liquor and melted butter; stir in. Cover tightly with plastic wrap and refrigerate until firm, at least 2 hours or overnight. Place the cocoa powder or nuts in a flat dish. Using 2 teaspoons, or a very small ice cream scoop, drop rounded, heaping teaspoonfuls of truffle mixture onto a large, parchment-lined baking sheet. 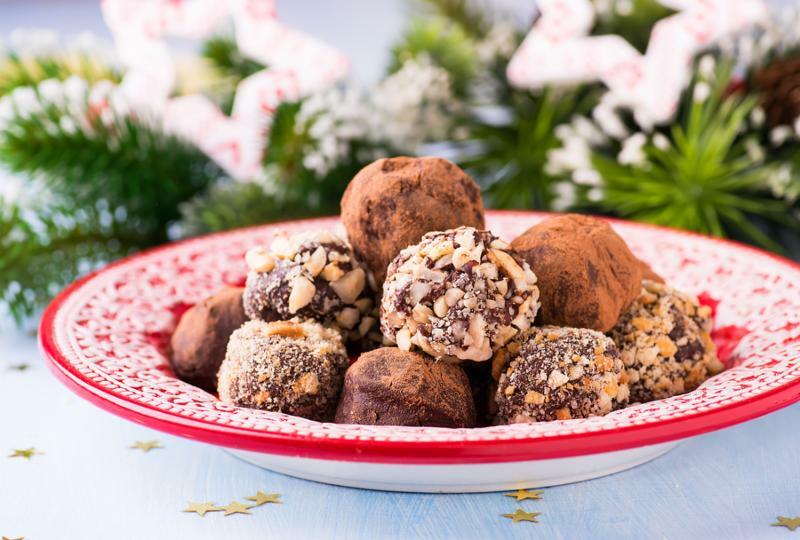 When all of the truffles are scooped, dip them in the cocoa and use your palms to roll the truffles into smooth 1-inch balls. Roll in chopped nuts or roll again in cocoa powder. Place in individual candy cups. Refrigerate, covered tightly, until time to pack as gifts or serve.